This elegant keepsake set is a clever way to celebrate two lives intertwined. 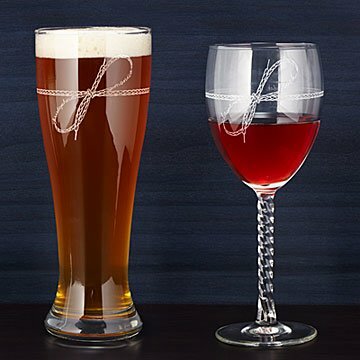 Toast the day you tied the knot with this creative keepsake set, which adds a twist to the classic wine and beer glass. Etched on each glass are your names incorporated into an elegant knot design, and a rope-inspired stem ties the look together. Every time you sip, you'll see your special date, too. Choose from either a pair of wine or pilsner glasses, or one of each—whether you love wine, beer, or both, it's a clever way to celebrate two lives intertwined. Glassware made in the US. Decorated in Reno, Nevada. Click here to see our Tie the Knot Champagne Flutes.